Long before Mercury, Venus, Earth, and Mars formed, it seems that the inner solar system may have harbored a number of super-Earths–planets larger than Earth but smaller than Neptune. If so, those planets are long gone–broken up and fallen into the sun billions of years ago largely due to a great inward-and-then-outward journey that Jupiter made early in the solar system's history. This scenario has been suggested by Konstantin Batygin, a Caltech planetary scientist, and Gregory Laughlin of UC Santa Cruz in a paper that appears the week of March 23 in the online edition of the Proceedings of the National Academy of Sciences (PNAS). The results of their calculations and simulations suggest the possibility of a new picture of the early solar system that would help to answer a number of outstanding questions about the current makeup of the solar system and of Earth itself. For example, the new work addresses why the terrestrial planets in our solar system have such relatively low masses compared to the planets orbiting other sun-like stars. "Our work suggests that Jupiter's inward-outward migration could have destroyed a first generation of planets and set the stage for the formation of the mass-depleted terrestrial planets that our solar system has today," says Batygin, an assistant professor of planetary science. "All of this fits beautifully with other recent developments in understanding how the solar system evolved, while filling in some gaps." 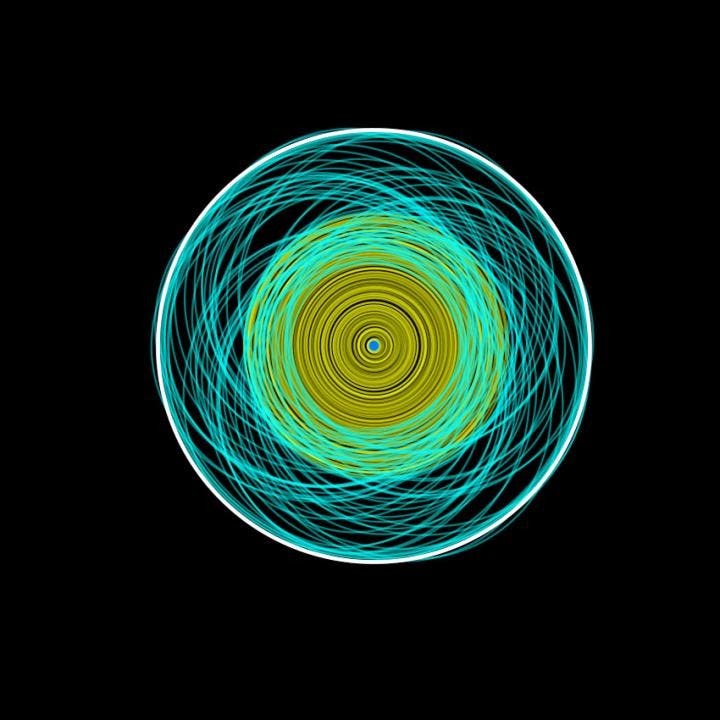 The image below from a new simulation by Caltech and UC Santa Cruz researchers depicts a time early in the solar system's history when Jupiter likely made a grand inward migration (here, Jupiter's orbit is represented by the thick white circle at about 2.5 AU). As it moved inward, Jupiter picked up primitive planetary building blocks, or planetesimals, and drove them into eccentric orbits (turquoise) that overlapped the unperturbed part of the planetary disk (yellow), setting off a cascade of collisions that would have ushered any interior planets into the sun. Thanks to recent surveys of exoplanets–planets in solar systems other than our own–we know that about half of sun-like stars in our galactic neighborhood have orbiting planets. Yet those systems look nothing like our own. In our solar system, very little lies within Mercury's orbit; there is only a little debris–probably near-Earth asteroids that moved further inward–but certainly no planets. That is in sharp contrast with what astronomers see in most planetary systems. These systems typically have one or more planets that are substantially more massive than Earth orbiting closer to their suns than Mercury does, but very few objects at distances beyond. "Indeed, it appears that the solar system today is not the common representative of the galactic planetary census. Instead we are something of an outlier," says Batygin. "But there is no reason to think that the dominant mode of planet formation throughout the galaxy should not have occurred here. It is more likely that subsequent changes have altered its original makeup." According to Batygin and Laughlin, Jupiter is critical to understanding how the solar system came to be the way it is today. Their model incorporates something known as the Grand Tack scenario, which was first posed in 2001 by a group at Queen Mary University of London and subsequently revisited in 2011 by a team at the Nice Observatory. That scenario says that during the first few million years of the solar system's lifetime, when planetary bodies were still embedded in a disk of gas and dust around a relatively young sun, Jupiter became so massive and gravitationally influential that it was able to clear a gap in the disk. And as the sun pulled the disk's gas in toward itself, Jupiter also began drifting inward, as though carried on a giant conveyor belt. 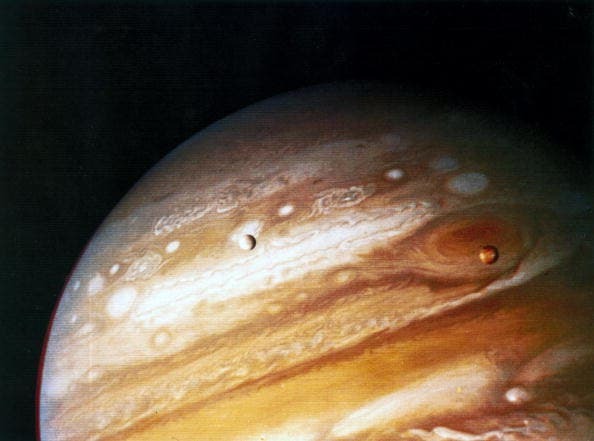 "Jupiter would have continued on that belt, eventually being dumped onto the sun if not for Saturn," explains Batygin. Saturn formed after Jupiter but got pulled toward the sun at a faster rate, allowing it to catch up. Once the two massive planets got close enough, they locked into a special kind of relationship called an orbital resonance, where their orbital periods were rational–that is, expressible as a ratio of whole numbers. In a 2:1 orbital resonance, for example, Saturn would complete two orbits around the sun in the same amount of time that it took Jupiter to make a single orbit. In such a relationship, the two bodies would begin to exert a gravitational influence on one another. In an earlier model developed by Bradley Hansen at UCLA, the terrestrial planets conveniently end up in their current orbits with their current masses under a particular set of circumstances–one in which all of the inner solar system's planetary building blocks, or planetesimals, happen to populate a narrow ring stretching from 0.7 to 1 astronomical unit (1 astronomical unit is the average distance from the sun to Earth), 10 million years after the sun's formation. According to the Grand Tack scenario, the outer edge of that ring would have been delineated by Jupiter as it moved toward the sun on its conveyor belt and cleared a gap in the disk all the way to Earth's current orbit. But what about the inner edge? Why should the planetesimals be limited to the ring on the inside? "That point had not been addressed," says Batygin. Batygin and Laughlin's calculations and simulations show that as Jupiter moved inward, it pulled all the planetesimals it encountered along the way into orbital resonances and carried them toward the sun. But as those planetesimals got closer to the sun, their orbits also became elliptical. "You cannot reduce the size of your orbit without paying a price, and that turns out to be increased ellipticity," explains Batygin. Those new, more elongated orbits caused the planetesimals, mostly on the order of 100 kilometers in radius, to sweep through previously unpenetrated regions of the disk, setting off a cascade of collisions among the debris. In fact, Batygin's calculations show that during this period, every planetesimal would have collided with another object at least once every 200 years, violently breaking them apart and sending them decaying into the sun at an increased rate. "It's a very effective physical process," says Batygin. "You only need a few Earth masses worth of material to drive tens of Earth masses worth of planets into the sun." From that point, it would take millions of years for those planetesimals to clump together and eventually form the terrestrial planets–a scenario that fits nicely with measurements that suggest that Earth formed 100-200 million years after the birth of the sun. Since the primordial disk of hydrogen and helium gas would have been long gone by that time, this could also explain why Earth lacks a hydrogen atmosphere. "We formed from this volatile-depleted debris," says Batygin. And that sets us apart in another way from the majority of exoplanets. Batygin expects that most exoplanets–which are mostly super-Earths–have substantial hydrogen atmospheres, because they formed at a point in the evolution of their planetary disk when the gas would have still been abundant. "Ultimately, what this means is that planets truly like Earth are intrinsically not very common," he says. The paper also suggests that the formation of gas giant planets such as Jupiter and Saturn–a process that planetary scientists believe is relatively rare–plays a major role in determining whether a planetary system winds up looking something like our own or like the more typical systems with close-in super-Earths. As planet hunters identify additional systems that harbor gas giants, Batygin and Laughlin will have more data against which they can check their hypothesis–to see just how often other migrating giant planets set off collisional cascades in their planetary systems, sending primordial super-Earths into their host stars. The researchers describe their work in a paper titled "Jupiter's Decisive Role in the Inner Solar System's Early Evolution."